This article is mostly relevant for Admins and Managers in Forecast. We will go through some neat tips, tricks and hacks to nail your project planning, whether it be pre-planning, planning, or running. During the pre-planning phase you should always make sure that the project timeline is aligned with the actual needs and demands of the project. Maybe you involve your client in this process. There are two ways to manage your project timeline. If you prefer to manage your milestones visually, you can do so using the Timeline tab in your projects. You simply move milestones around by dragging them on the timeline. Likewise, you can extend or shorten milestones by dragging the edges of the milestones bars. Otherwise, if you just want to do it by dates, you can do so as well by using the Scoping tab, which allows you to adjust the start dates and deadlines of each milestone in your pipeline. Another great tip for your pre-planning is to utilize the ability to add virtual users to Forecast. Virtual users are free, and can't sign in to Forecast. Meaning, those users don't actually have to be actual people. This tip goes on creating virtual users for different roles to plan and reserve future needs in your schedule. For instance, having a virtual user named "Senior Developer" with the role of a Senior Developer, and the added skill of "Backlog". This lets you schedule the user for future demand in Scheduling. The reason for adding the role and skill is for filtering purposes. Filtering your Scheduling by role, e.g. "Senior Developer", and by the skill "Backlog", you'll be able to see just your virtual user, "Senior Developer", to add the future needed allocations in the timeline. Now, removing the "Backlog"-filter from the view, you'll now see your virtual user among the actual Senior Developers. Here, you'll easily be able to see who's available in the timeframe you just reserved with the virtual user. Book the people you need as usual. You can do this with any of your roles. If you want a more automated approach, we also have the Quick Book feature found in the allocations view of Scheduling. This kindly asks you what role you need, for which project, and when you need it. Based on this, Quick Book will show a list of available people - ready to book with the click of a button. Those are two approaches to doing proper pre-planning. Use the one you like best. Utilizing filters and skills lets you easily find the exact people with the right roles and skills in Scheduling. This lets you look at just the people you want. We have similar filtering options for other features, like Workflow and Scoping. Assigning cards to people is of course possible directly from any open card by managers or people themselves, but if you want to assign from the perspective of Scheduling you can do that too. In Scheduling, selecting the "Viewing cards"-option at the top, switches the view to Cards instead of Allocations. Then at the right of Scheduling, you find a side column called "Unassigned". Expanding this, lets you see all the unassigned cards in your projects. From here you can easily drag the cards onto people in the schedule, and see how it fits with the rest of their work. To assign cards easily, you can with advantage use the "Project"-filter to only view people allocated to a specific project, and likewise use the "Project"-filter in the Unassigned column as well. Continue assigning until you have assigned all of your cards. Pro Tip: Using filtering both in Scheduling, and the Unassigned sidebar, lets you finish assigning cards in record time. Once again, aligning and adjusting the Timeline is important to keeping the project afloat. Depending on the size of your projects, it might be a good idea to outsource the process of assigning cards. Maybe you have a specialist for each role used in the project. If you're running your projects with Sprints, i.e. Agile with Scrum, you get an extra level of planning. Apart from Scoping, you also have Sprints. You do the normal Scoping to build your Statement of Work (SOW) in the planning phase, and then during the running phase you move cards from the Backlog into Sprints. Sprints are usually a period of 14 days, but this may vary. Read more about Agile with Scrum. Using the Projects view in Scheduling, you're able to see the stages of your projects. Hovering over a project bar, or a milestone bar when expanded, provides you with instant information on the current capacity within the project or milestone. This makes it easy to see whether you've allocated too much or too few resources. Taking action is easy. Clicking the project or milestone triggers a box to find the resources you need with the Quick Book feature. Using the People view in Scheduling, lets you either view Allocations by selecting "Viewing allocations", or Cards by selecting "Viewing cards" in the dropdown menu above the timesheet. Viewing allocations, lets you view people's allocated hours out of their total available hours, and by expanding a person you'll see exactly which projects they're allocated to. Viewing cards, likewise lets you see the allocated hours, but this time you'll see the cards they're assigned to when expanding a person. 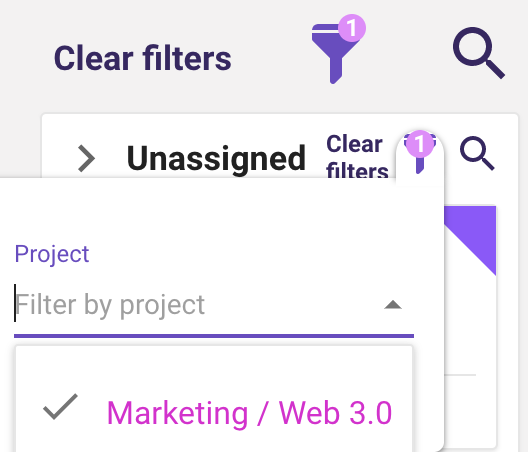 This feature lets you connect smaller related projects into a group of projects. This gives you a unique overview of everything going on in each project. 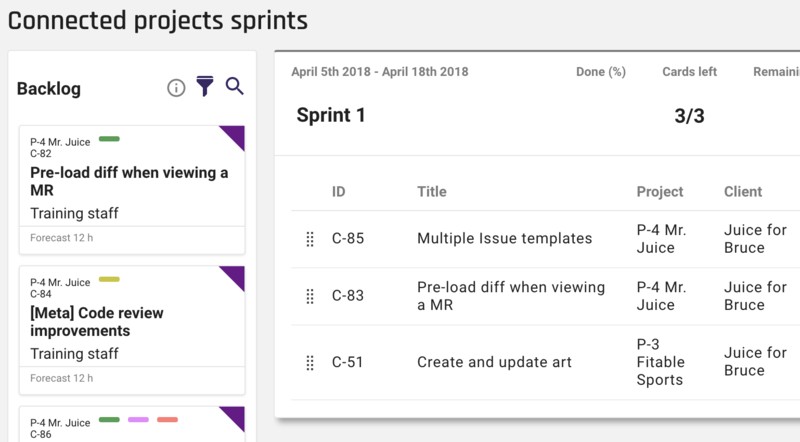 Workflow columns, Sprints, Team, and Settings will all be aligned, and kept in-sync across the connected project. This should significantly ease project planning. Now, you do the planning from one single view, instead of switching between several projects to align. Additionally, if you're working in Sprints, e.g. through Agile with Scrum, Connected Projects is a super powerful feature. Connected Projects lets you plan Sprints across the projects, and thus make sure all projects work towards a common goal, e.g. a feature release or a product launch.